I remember a long time ago, I went skiing with Ryan in Tahoe; we’re talking about when we were way young. It was lightly snowing, and there was the typical sights of snow piles pushed to the sides of the roads so cars can go by. It was dinner time and we decided to have some Japanese food, so we found a place around the area. This was before Yelp. You know when you just looked for a restaurant. But I remember I order Rolled Chicken stuffed with imitation crab. It had a panko crust and the center was creamy. The portion was huge, but I managed to eat it all with some encouragement from the table. I was so impressed by it I obviously haven’t forgotten. It was the first time I ever saw something rolled into meat, where you see that fantastic spiral stuffing. I’ve never tried to make that exact chicken dish before, but I have made several rolled chicken, made with a variety of stuffings. The idea is simple, take any meat and pound it thin, and put your stuffing in a layer so that when you roll the meat, you get that spiral effect. It’s awesome. The hard part is making it thin. This time, I bought thin cut flank steak. I didn’t plan on making this, it just happened. And that steak was totally on sale. At home, I took a pan and tried to pound the steaks thin and evenly; my neighbors definitely hate me. You can pound it as thin as you want. I had to sacrifice some thinness out of courtesy to my neighbors. But I would want it as thin as possible to get a nice texture next time. And it really doesn’t matter what shape it is, just make it even. When you have your thin steaks ready, marinade it with 1 lime, garlic, agave, black pepper and a dash of soy sauce for about an hour. It’s thin so it could even go for less. The stuffing is really easy and should be done while the steak is marinating. Turn your broiler on high. Toss whole anaheim peppers with olive oil and salt, and place them on a baking sheet, and then under the broiler. In the mean time, finely cut thin slices of onions, about half and onion. As thin as you can. Place the onion slices in a bowl with lime juice, salt, and pepper. Then chopped some mint and parsley and mix it in with the onions. You want to let this mixture sit while you roast the peppers. The acid from the limes is going to break down the onions and really get the flavors going. When the skin of the peppers are blackened, turn them over and blacken that side. Once they are all done, let cool. I was impatient so I put them in foil and threw them in the freezer for about 5 minutes. Once cool, remove the skin, stem, and seeds. Slice the flesh and throw the slices into the onion mixture. The steaks should be good now (even if it wasn’t an hour, the longer the better) . Remove from the marinade, and pat dry with papper towels. Lay the steaks on a cutting board and layer the onion mixture evenly on each steak. Then take on edge and roll the steaks like you are rolling a poster. Use skewers, or twine, or toothpicks to hold the rolls together. To cook, sear the rolls in a pan on high heat, rotating it to even look the outside. Because my rolls where medium sized, I finished the cooking in a 375F oven for about 5 minutes. You can always slice into one to see if the center is cooked. I cooked my medium rare. Once done, let the rolls cool on a cutting board for 5 minutes. And there you have it, something that looks awesome and not hard to do at all. That spiral stuffing is definitely a show stopper. I wish I had made a demi glaze with it, I just totally forgot. 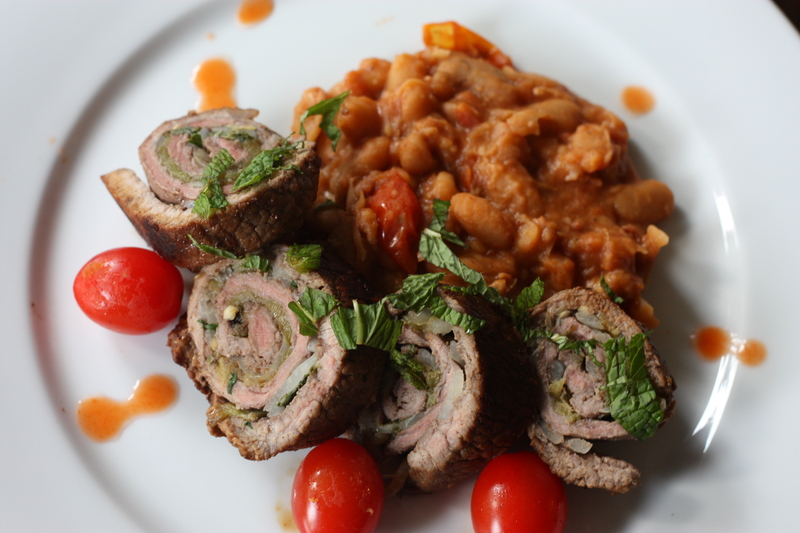 I served this with a white kidney bean side and some grape tomatoes. You can do this with basically any meat too! So give it a try (if you have forgiving neighbors). 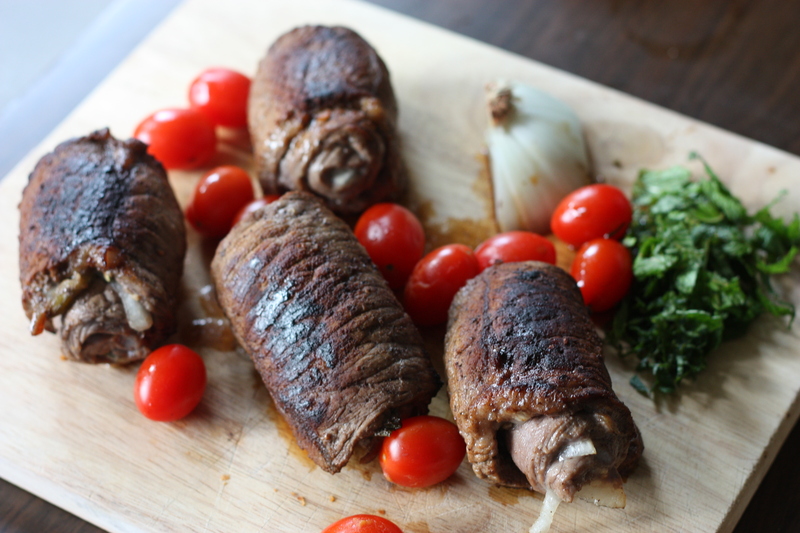 This entry was posted on April 11, 2012 by rrfoods in Dinner, Redmeat and tagged flank steak, rolls, spiral, stuffing.